www.VocalBoothToGo.com – Drummers have a bad reputation for being too noisy. Trying to practice with neighbors can be difficult. Adversely, living next door to a banging drum set can be difficult as well. We made this video to show you first-hand how just one layer of our Producer’s Choice Sound Blankets can reduce the sound coming from your drum set in your practice space. These sound absorbing blankets, usually meant to acoustically treat, actually yielded a certain degree of sound proofing. A very cost efficient solution with incredible results! Thanks for watching and make sure to subscribe to our channel and check out our website. 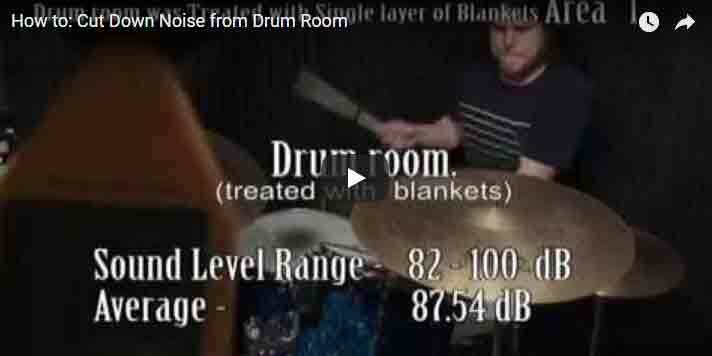 This entry was posted in Drum Room Acoustic Treatment, Producer's Choice Acoustic Blankets, Videos and tagged apartment noise from bands, cut down drum noise, cut down music noise, sound bankets, soundproofing, soundproofing your walls.